Also known as Foam Roll Upper Back and Myofascial Release Rhomboids. Lay down with your back on the floor. Place a foam roll underneath your upper back, and cross your arms in front of you, protracting your shoulders. This will be your starting position. 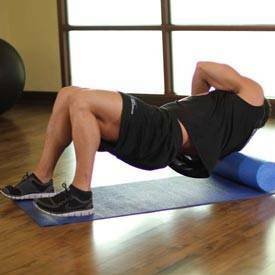 Raise your hips off of the ground, placing your weight onto the foam roll. Shift your weight to one side at a time, rolling over your middle and upper back. Pause at points of tension for 10-30 seconds.